Many gardeners are familiar with growing rhubarb from divisions or crowns, but if you want to start a large rhubarb patch quickly, without spending a lot, growing rhubarb from seed is the answer. The stems of rhubarb grown from seed will not all have that intense red color you might be used to. Some stems will be red, some green, and some in between. But they will all taste the same, perfect for your home-cooked pie. If you want all red stalks, get divisions from a friend or neighbor or buy crowns from your local nursery. When starting your seeds, remember that rhubarb is a cool-weather crop. In climate zones 6 and cooler, it’s an easy-to-grow perennial (traditionally planted where there used to be an outdoor privy). The stalks and leaves die back with first frost in the fall, but the plants will come right back in early spring. In zones 7 to 8, growing rhubarb is tricky. but it can be grown as a short lived perennial. You will need to be careful to shelter your rhubarb plants from extreme summer heat. Choose a location with afternoon shade in the summer. The north side of a grape arbor, raspberry patch, or asparagus ferns would work well. 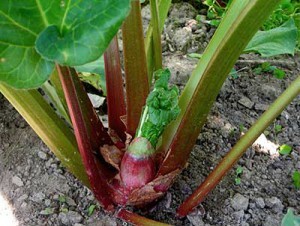 In areas with very hot summers, where winters are mild (zones 9 to 10), rhubarb can be grown from seed as a winter annual. ECHO ("Educational Concerns for Hunger Organization") in Florida has had good luck with planting rhubarb seed in August and harvesting in March-May. The variety Victoria is noted as a productive late summer/early fall started annual from almost subtropical Florida to semi-arid northeast Texas. 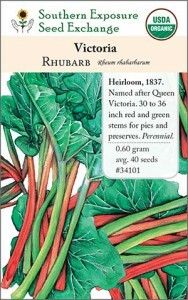 Read how to do this in “Growing Rhubarb from Seed as an Annual” below. Rhubarb seeds are encased in a large paper-like shell. To speed germination, soak your seeds in water for 1-2 hours before planting. If you’re starting indoors, plant the seeds in screened compost or other suitable organic planting mixture, 2 seeds per 2 to 3 inch pot. Using peat pots or cow pots makes transplanting easier. For spring plantings a heating cable or mat will speed the germination if the room temperature is below 70°F. Rhubarb seeds germinate quickly when planted in the warmth of late August or early September. Keep your seedlings evenly moist but don’t over-water (the seedlings can die from root rot if the ground is too wet). To start rhubarb in the spring (zones 8 and lower), sow seed in pots or flats under cover 8-10 weeks before your average last frost. Transplant the young plants out into the garden about two weeks before your average last frost, into an area amended with compost or well rotted manure and plenty of organic matter. The plants should be about 4 inches tall. Mulch your seedlings to maintain even soil moisture and keep the roots cool. Harden plants off before transplanting or protect the new transplants with row cover until danger of frost has passed. Choose a location protected from the heat. The warmer your climate, the more important it is to provide afternoon shade (on the west and south) during the hottest months. A row of tall annual plants (your late summer tomatoes or pole lima beans), shade cloth, or a temporary structure can provide adequate shade that you can remove when the weather cools. Always remember to maintain even moisture. Letting your young rhubarb plants dry out in hot weather is the kiss of death. To grow rhubarb as an annual in the fall and winter (zones 9 and higher), start the seeds in a cool location (a bright indoor spot or a shady outdoor place) from late August to early October. Transplant into the garden when the seedlings reach about 4 inches tall. The plants will be ready for harvest in March through early May. Intense summer heat will kill the plants, so harvest all the leaves in late spring. This technique only works where winters are very mild, or if you can protect the plants from damaging frost with a cold frame or row cover. Harvest rhubarb either by cutting or pulling off the leaf stalks at soil level. When your plants have 10 stalks you can harvest 3 or 4 stems at a time per plant. If you are growing your rhubarb as an annual harvest the entire plant. Harvest stalks only! DO NOT eat the rhubarb leaves as they contain high levels of toxic oxalic acid. For perennial plantings let some leaves remain on the plants during summer to generate energy and reserves for the following year. We recommend harvesting a few stems at a time, in spring and fall only. It’s best not to stress the plants during the summer, so avoid harvesting at this time. Frost will kill all the leaves, so harvest all the leaves when frost threatens in the fall. It’s best not to harvest during the first year if you are establishing a perennial bed. For annual beds, harvest all remaining stalks when the weather begins to get too hot in the summer. Ira Wallace lives and gardens at Acorn Community Farm, home of Southern Exposure Seed Exchange, where she coordinates variety selection and seed growers. Southern Exposure offers 700+ varieties of non-GMO, open-pollinated, and organic seeds. Ira is a co-organizer of the Heritage Harvest Festival at Monticello. She serves on the board of the Organic Seed Alliance and is a frequent presenter at the Mother Earth News Fairs and many other events throughout the Southeast. Her first book, “The Timber Press Guide to Vegetable Gardening in the Southeast,” is available online and at booksellers everywhere.